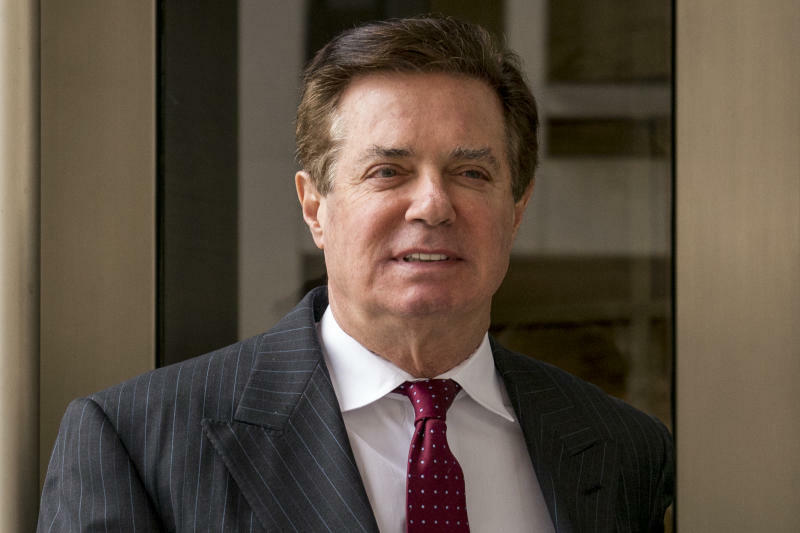 WASHINGTON (AP) — An August 2016 meeting between President Donald Trump's former campaign chairman and an associate with ties to Russian intelligence goes to the "heart" of the Russia investigation, according to a court transcript unsealed Thursday. The transcript from a sealed hearing in Paul Manafort's case provides further insight into what special counsel Robert Mueller considers significant in his wide-ranging probe of the Kremlin's efforts to sway the 2016 presidential election and the ties between Trump associates and Russia. It makes clear that prosecutors have homed in on the repeated contacts between Manafort and his longtime associate, Konstantin Kilimnik, who the FBI says has ties to the Russia's military intelligence agency. Still, it's unclear what specifically has piqued prosecutors' interests and whether it is connected to any election interference conspiracy. The transcript of the hearing, which took place Monday, was released by court order Thursday, but much of it was redacted to protect the ongoing investigation, including several key portions about Manafort and Kilimnik. According to the transcript, prosecutor Andrew Weissmann said the substance of the meeting, which took place in New York just weeks after the Republican National Convention, goes to the "larger view of what we think is going on" and what "we think the motive here is." "This goes, I think, very much to the heart of what the Special Counsel's Office is investigating," Weissmann said, noting Kilimnik's past intelligence ties and Manafort's position at the top of the Trump campaign at the time. "That meeting and what happened at that meeting is of significance to the special counsel." Previously, Manafort's attorneys accidentally revealed that among the topics discussed by Manafort and Kilimnik during the election was a possible peace plan to resolve the Russia-Ukraine conflict in Crimea. They also disclosed that Manafort had shared polling data on the Trump campaign with Kilimnik. But it's unclear if Weissmann was referencing those topics in his comments Monday. The transcript does reveal that Rick Gates, Manafort's longtime protege who also served on the Trump campaign, attended the meeting. And prosecutors say Manafort and Gates sought to conceal that they met with Kiliminik by taking the "precaution" of leaving separately. Gates also spoke to investigators about Manafort sharing the polling data, according to the transcript. Prosecutors also revealed new details about Manafort's later actions of interest to investigators. They disclosed that Kilimnik traveled to Washington for Trump's January 2017 inauguration and met with Manafort. They also revealed that in 2017 and 2018— years when Manafort was under federal investigation and later indictment for his work in Ukraine— he arranged for polling in the country on behalf of an unnamed Ukrainian political figure. Weissmann explored those details during Monday's hearing as he argued that Manafort repeatedly lied during interviews with investigators after he cut a plea deal. Manafort has denied intentionally making false statements. U.S. District Judge Amy Berman Jackson is now tasked with deciding whether Manafort's statements constituted a breach of his plea agreement. A second sealed hearing on the matter is set for next week. Jackson's ruling could affect Manafort's sentencing on two felony charges stemming from illegal lobbying on behalf of Ukrainian interests. Manafort faces a separate sentencing in Virginia on tax and fraud charges. In that case, Manafort faces the possibility of a decade in prison.